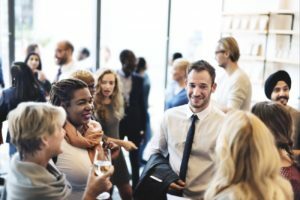 Remember: networking events have different rules from everyday life. You’re free to excuse yourself after even a very brief exchange. A way to break free is to verbalize your purpose for coming to the event: You can simply say, “Well, it was really nice talking with you. I should be sure to mix and mingle with everyone here.” Exchange business cards if you want, but don’t make promises of connecting later unless they’re genuine. In the same way that it’s easier “to find a job if you already have one,” it’s easier to find a new conversation partner if you already have one. If you’re stuck talking to “Joe” and you see someone walking by alone, it’s great form to smile, make eye contact and extend your hand to introduce yourself as a way of inviting the new person to join you and Joe. Once that person joins, you can focus on them instead. Or you may just slide away from Joe more easily since he’s now talking to the new person you brought into the circle. Business Etiquette: Who opens the door? Wine Tasting and Tasting Room Etiquette Business Etiquette: Who opens the door?